If you are reading this, it’s because it was written earlier today and set to future post as I will be performing at the Sweet Surrender Dessert Cafe in Louisville (KY) when this autoposts. 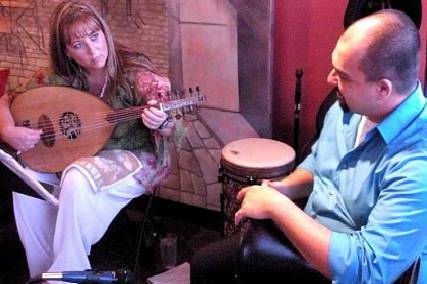 The group I’ll be playing with is Ahel El Nagam, a Kentuckiana based Classical Arabic music group. Ahel El Nagam means, “people of the tune.” We are a new Middle Eastern music band in Louisville, KY. We were founded in April of 2007 and we are working hard to develop a repertoire full of traditional and classical Middle Eastern songs. We are available for cultural events, private parties, and shows at restaurants and coffee houses around Louisville as well as the greater tri-state (Indiana, Kentucky and Ohio) area. More info about us and my relationship with the group may be found in a previous post. On Thursday, March 24, Sweet Surrender Dessert Café will host a fundraiser to benefit The Leukemia & Lymphoma Society. All day, from 10 AM to 10 PM, a sampling of 10 desserts will be offered for $15 per person. Coffee is included. A portion of the entire day’s proceeds will be given to The Leukemia & Lymphoma Society Team in Training. A whole 10” cake and other prizes will also be raffled off. Tickets for the raffle can be purchased for $2.00 each throughout the week. All of the proceeds from the raffle will go directly to The Leukemia & Lymphoma Society. In addition to great desserts and great prizes, live music will begin at 8 PM. The group formed sometime in the middle of 2007 and I believe my first performance with them was sometime during the Spring of 2008. At it’s formation the group was four members strong with an instrumentation that ranged from oud, tabla (Egyptian tabla), flute/bellydance, electric sitar/mandolin. The first couple of shows I played with them (with cello) we had a five member group. To a degree the audience reacts as it has seen Sufis react, and this is often in a rather wild and free way. Yet in many of the leading writings on the topic the Sufis stressed the significance of remaining quiet and contemplative when listening to music, and if the music and dance throws one into ecstasy then obviously we might act wildly, but when when that stage is over we should be quiet and still, physically and mentally. As al-Ghazali puts it, in the Iha’ ‘ulum al-din it is often the quietest person who achieves the highest degree of ecstasy (wajd). Al-Ghazālī (1058-1111 AD) was a Persian Sufi. His work, Iḥyāʾ ʿulūm al-dīn (a Sufi treatise translated as “Revival of Religious Sciences”), is regarded by some to be the greatest work of Muslim (Sunni) spirituality after the Qurʾān. Sure, most Westerners know about Sufism through a passing knowledge of that other Persian Sufi, Rūmī (1207-1273 AD), but as is often the case what becomes popular in the West isn’t necessarily a representative (or the representative) proponent of a cultural artifact from another country or time (e.g. Zen Buddhism; Tai Chi; Trancendental Yoga). With the raging debate about Western Classical music not “connecting” with modern audience being one reason for its decline it just seems a bit disingenuous since there are plenty of contexts wherein a performance tradition can and will favor silent reception of performances. It’s disingenuous since it sets up a false dichotomy between “Stuffy Art Music” and “Engaging Popular Music” and the “Silent and Passive” reception of the former as opposed to the “Noisy and Active” engagement of the latter. Not that Classical music concerts aren’t generally silent so much as silence doesn’t mean passive. Or rather, the two aren’t equivalent. And neither are folks who are being noisy necessarily actively engaged by or with the music. Sometimes it is often the quietest audience members who achieve the highest degree of engaged ecstasy! This is a prewritten post as I will be performing at the Perkfection Cafe & Bar with Ahel El Nagam, Louisville’s Classical Arabic Band, and the Gypsies of the Nile bellydancer troupe. If any readers are so inclined then please come to the show for live Classical Egyptian and Arabic music as only Ahel El Nagam can present and live bellydancing by the Gypsies of the Nile.